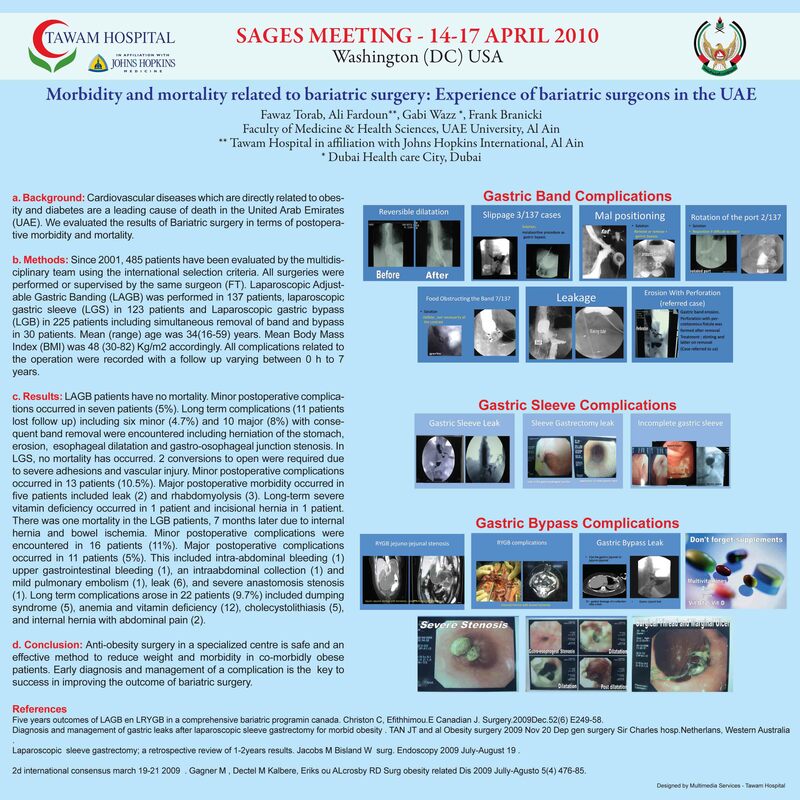 The bariatric surgery is demanding in the UAE and other gulf countries for the high incidence of diabetic patients , infertility in females , sleep apnea and other disturbances . starting bariatric surgery needs good training and good hospital stuff support otherwise serious complications can occur. We have started bariatric surgery program since 2001 and 423 cases is done till now . starting with gastric banding ,135 cases done , 156 gastric bypasses and 132 sleeve gastrectomies. our center of multidisiplinary team formed by dietetitions , endocrinologists, psychiatrics , sleep clinic , anesthesist and bariatric surgery team of one consultant and several specialists and residents. This study is to compare our rate of complications with other centers of excellence and how to deal with complications and how to avoid if possible. In 135 cases of gastric banding we had 6 slippage 3 port rotation. 4 erosions . 2 cases of intraabdominal trocar site bleeding . no abscesses in port site or wall or intraabdomenaly. Foreign body band obstruction 7 cases . In 156 cases of gastric bypasses we had 5 leaks 3 treated conservatively npo reserving drains and covering with antifungal and wide spectrum antibiotics. the other two one treated by laparoscopic repair and the last leak was jejunojejunal complicated with compartemental syndrome and ended with laparotomy and residual small bowel fistula. Intraluminal bleeding 3 cases treated conservatively . DVT 2 cases and 2 pulmonary embolisms . 3 gastro-jejunal steno- sis treated with endoscopic dilatations. In 132 sleeve gastrectomies done ; 4 bleedings treated conservatively one with residual contained hematoma resolved spontaneously. NO LEAKS. 3 Rhabdomiolysis . 5 decubitus sacral erithema and ulcers . one incisional hernia in laparoscopic sleeve . one trocar site abscess , 2 DVT . one dry mouth syndrome . Complications of bariatric surgery can be avoided with dealing properly with them and when starting early to discover and manage. complications with direct relation with the learning curve decreasing with the time when in getting expert and knowing the most common complications of bariatric surgery and even the rare pathologies.